Eazy Peezy Car Rental, our proud partner of Drive.MY! 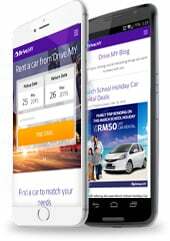 Eazy Peezy Car Rental is a well-established car rental provider in Kuala Lumpur and Selangor. It has been established in May 25, 2013 with a single unit of car and currently it has wide range of cars available for rental. Since demand for car rentals in Klang Valley is increasing, Eazy Peezy Car Rental is also growing very fast in its operation as more fleets will be coming in to serve the customers. There are wide variety of vehicles to choose from such as MPV, sedan, hatchback and also compact car. The top priority of the company is customers' satisfaction and due to this reason, Eazy Peezy Car Rental provides only new, clean and well-maintained vehicles to its valued and precious customers. Eazy Peezy Car Rental is also providing other related services such car delivery, airport transfer and also charter service with affordable and reasonable fees. Although this company is a local-based, more than 80% of its customers are foreigners from different countries and backgrounds. Most of them are international students, expatriates and also tourists from countries such as India, Mauritius, Sri Lanka, Arab Saudi, Bahrain, Lebonan, Egypt, Palestine, Dubai, Iran, Somalia, Kenya, Thailand, Singapore, Indonesia, Vietnam, Brunei, Japan, Kazakhstan, UK, Sweeden and many others. Eazy Peezy Car Rental strives to be among the best and cheapest car rental provider in Kuala Lumpur and Selangor with 5-star rating services to all its regular and also new customers while maintaining and improving its profitability and sustainablity.